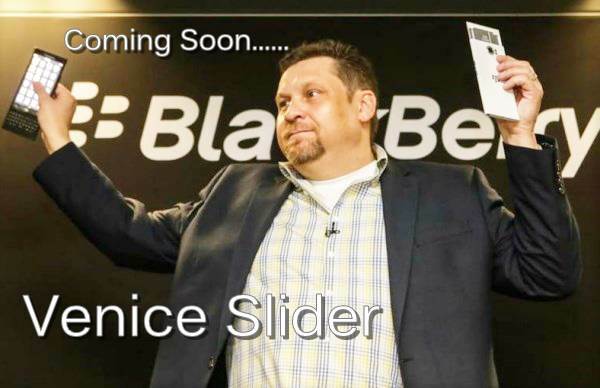 Good news for Blackberry and Android lovers, Blackberry’s much awaited android smartphone coming soon to rule the Android smartphone market, I am talking about the all new BlackBerry Venice slider smartphone. According to latest leaks, BlackBerry Venice with dual-edge curve display like Samsung Galaxy 6 Edge will launch in Q4 priced under $500 through online retailer AT&T, the US telecom operator. It will counter Samsung Galaxy 6 Edge and Upcoming Xiaomi Arch. How ever the pricing, specifications and Release date yet to be confirmed by Blackberry. According to latest leaks, BlackBerry Venice slider smartphone will offers you a bigger 5.4-inch QHD (1440×2560 pixels) Dual-edge display will run on the fastest 64-bit hexa-core , Snapdragon 808 SoC clocked at 1.8GHz with 3GB RAM, 32gGB/64GB/128GB variant but no MicroSD card slot. BlackBerry Venice will run on latest Android 5.0 Lollipop OS sport a huge 18-MP Rear Camera and 5-MP front camera for selfie packed with a 4000mAh battery including Dual-SIM Support, 4G LTE, NFC, Wi-Fi, Bluetooth, Finger Print scanner and USB Type C.
NFC, Wi-Fi, Bluetooth, Finger Print scanner and USB Type C.
At last I few honest , upcoming BlackBerry Venice coming to please the Android lovers. What you think? Please be open to give your view. What more you want in new BlackBerry Venice and Stay tuned for more updates.